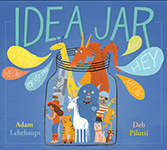 Adam Lehrhaupt is the award-winning picture book author of Warning: Do Not Open This Book!, Please: Open This Book!, Chicken in Space, Chicken in School, I Will Not Eat You, I Don't Draw, I Color and Wordplay (Scholastic, July 25, 2017), as well as the upcoming This is a Good Story (S&S, September 9, 2017), Idea Jar (S&S, Spring 2018) and several more he is not yet at liberty to discuss. He has traveled to six continents, performed on Broadway, and lived on a communal farm. 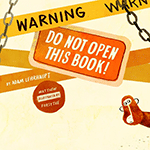 Adam firmly believes that opening a book is a good thing, even if there are monkeys in it. He currently lives in the suburbs of Philadelphia, PA, with his wife, two sons, and two bizarre dogs. Like many high school students, Adam had no idea what he was going to do with himself after graduation. The only class he enjoyed in school was art. So, Adam applied to art school. This was, perhaps, not the most well thought out idea. Turns out that, while Adam enjoyed art, he did not enjoy critiques of art. Especially his own. After one particularly painful critique, hoping that his issues might be resolved by a change of venue, Adam decided to look into another program. This led him to apply to Tisch School of the Arts at NYU. Adam very much enjoyed his time in New York. The program fit his style much better than his first school, and he studied everything from mask making, to directing for stage and film, to light and sound design. In the summers, Adam worked for a lighting company that sent him out on tour with bands like The Allman Brothers, Dave Matthews Band, Boys II Men, and even a few days with the WWF. Upon graduation, Adam drove around the country for a while. Eventually, his car broke down. He remembers something about the engine seizing, making a terrible noise, and then giving up. When the sun came up, he found himself in Lake Tahoe, CA. Needless to say, he stayed. Adam worked as a ski and snowboard instructor that winter, fully utilizing his hard-earned college degree. To their great credit, Adam's parents did not tell him he was wasting his time, or their money. In the summer, he took a job laying bricks during the day, and worked with the stage crew at Caesar's most nights. That is, until David Copperfield came through. Turns out, they needed someone with Adam's skills to help them get ready for their Broadway debut that December. Off he went. The answer to your first question is—Yes, he does. The answer to your next question is—No, he won't. You probably wouldn't believe him anyway. Adam worked for David for almost three years. As part of David's crew, he traveled all over the US, through South America, Europe, and Asia. It was a lot of work, but it was also a lot of fun. He made some great friends. Adam was able to go places he might never have gone. But, all things must come to an end. So, he moved on. What do you do after touring the world with barely a care? You volunteer to work on a kibbutz. Seemed like a good idea at the time. Adam made a quick stop to visit the folks, for a month or three, and then went off to Israel. For those that don't know what a kibbutz is, it is a type of communal farm. Life there is different. Adam had all kinds of jobs depending on the day. He farmed turkeys, delivered milk, set up tents, and he even did dishes and helped cook. But, this too would end, and Adam would return home. Upon his return, Adam went back to creating art. He worked for 10+ years as a Senior Art Director for a huge international company before taking up writing full time. Adam is much happier for the change. He has a great wife and two awesome boys who make him laugh every day. He has two of the most bizarre little dogs you'd ever want to meet. And, he has great experiences that he gets to write about. That sounds like an amazing life Adam, but how did you get started writing books for children? Well, I sat down to write my great American novel, full of war and politics and deep thinking, and what came out was a poem about a puppy. Instead of struggling to make the novel, I wrote what came out You can find more about this in my blog post here. Now, 150 poems, dozens of manuscripts, and countless drafts of new ideas later, here I am. Please drop a note to me, The Monkey, or any of my other characters, over here. We'd be happy to hear from you.